Well it’s our final day in Mae Sot and we’re wishing now we had the opportunity to stay longer. The more time we spend here, the more we feel like a part of this community. The only thing that could make it better would be a pool to throw ourselves in at the end of the day! Songkran is due to start on Sunday, so Saturday is the last opportunity we are going to have to spend time with the community and do any extra shopping. We’ve already purchased 100 watermelons for around $30, cookies as treats for the kids during Songkran, more batteries, headlamps, boots, so much food, medicine etc, so Fred’s stockpile is looking pretty good. Although we’ve spent a lot whilst we were here, we’re leaving more than three quarters of our donated money with Fred for use in the near future. The AFoETB family has been a huge support – we’re just the ones delivering what everyone else has contributed to – and we’d like to sincerely thank our AFoETB family for contributing a massive $4,200 in money and 80kgs in clothing. Without them, none of what we brought over would be possible, and Fred was truly overwhelmed and appreciative that the Aussie chapter of the ETB family is on board and also understands what ETB is trying to achieve. We started the day with needing to fix the taps on a water tank – so Geoff came in very handy. Megan and Suz spent this time at the on-site medical centre dressing wounds, providing paracetamol and assisting wherever we could – luckily enough Atun, ETB’s interpreter, made it so much easier to assess the issues and provide correct medication. The main problem at the moment is heat – people are dehydrating so quickly. Sometimes they forget to drink water to stay hydrated as they work – it’s just that time of year. 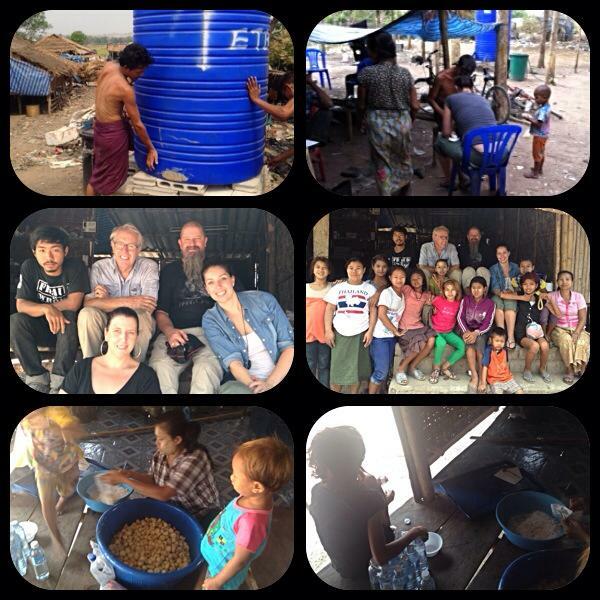 When everyone returned to the community centre, we were so privileged to enjoy some traditional Burmese food made by the ladies of the community. This offering is traditionally served around Songkran and is called Mote Lone Yaw Paw – a rice flour based ball rolled in coconut, stuffed with sugar or peanuts, or in Megan’s case, chilli – which was hysterical to watch. Megan is usually pretty good with spicy food, but it appears that a whole chilli inside a rice ball is pretty much over her limit. We’ve never seen someone move so quickly, running around with her mouth open trying to dissipate the heat. 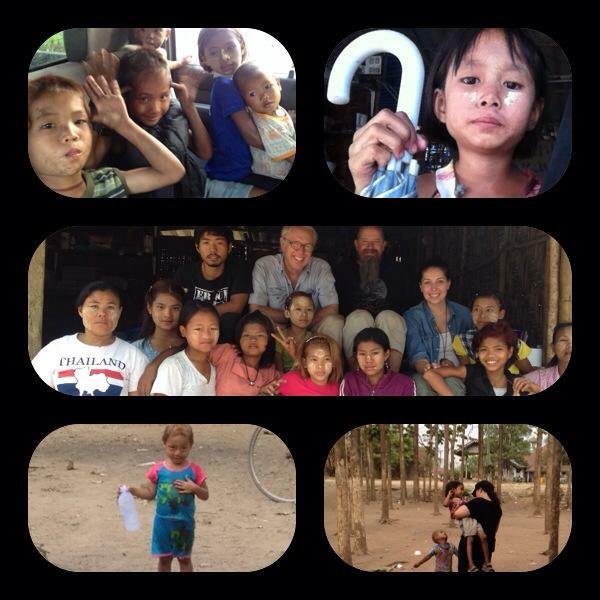 The whole community was crying with laughter – so good to see the ‘farang’ can make an impression! As a special treat, Fred provided an opportunity for the kids who have been taking English lessons to take a trip into Mae Sot to have lunch together. This really was a treat, not only for the kids, but for us as well. The kids all raced home to clean themselves up and put on beautiful clothes – this opportunity does not come along every day. We were going to head to a restaurant that welcomes Burmese children, but unfortunately (or fortunately in this case) it was closed. 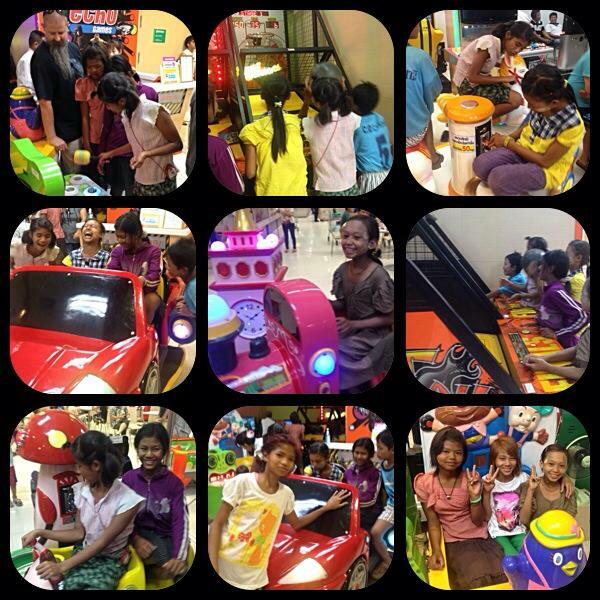 After much discussion (between the kids) it was decided to go to Tesco Lotus – the main shopping centre in Mae Sot. Bear in mind, only 2 of the kids had been to this centre previously, so this was a very big deal to the other kids. Arriving at Tesco, we were very quickly schooled in the fact that these kids are still learning. None of them have street skills – they’re so used to just running around, they don’t know to look for traffic. This brought about the first lesson in looking both ways – and the kids picked it up straight away. The looks on their faces as we walked into Tesco was priceless, as was the looks on the faces of the Thai/Burmese people in Tesco when we walked in. Farangs and a group of Burmese kids together – apparently not a sight you see in town every day. There were a lot of stares, but as Mae Sot is not a tourist town, guess we can understand that the ‘farangs’ stood out. The kids were fantastic. Although they don’t get this opportunity very often, they were so polite and appreciative; and they were by far the best behaved kids at the centre. After a beautiful lunch – which the kids all ordered for themselves, Geoff purchased some tokens for them to use on the games – oh wow – the absolute joy on their faces just said it all! They were beside themselves, laughing, sharing and having such a good time. This is what it’s all about They’ve worked so hard going to school during the week and learning English on weekends –this was their extra special reward. So many other kids want to do this program, but unfortunately at the moment, finding the right teachers to undertake the lessons is the challenge Fred faces. It’s important to have the right people on board, people that understand the culture and understand the kids. Knowledge Zone, where the classes are held on Saturday and Sunday mornings, is going really well; but is at capacity, and the private teacher Fred has engaged for Saturday and Sunday afternoon lessons is fantastic; but she can only take a maximum of 7 students at any one time (again, at capacity). Fred is working hard to find more teachers so that more students can get on this program, so hopefully in the next few months, the numbers will increase. Heading back to the dump was the last opportunity this trip to catch up with the families living and working here. Songkran is about to commence, so everyone is in a pretty relaxed and happy mood. The next few days will be filled with laughter and joy, but after that comes preparations for the rainy season. After 7 years, Fred and the ETB community are well aware of what lies ahead. Although you can prepare as much as possible, there will always be unforeseen challenges arise. Picking gets harder because of the weather, illness is more prevalent and it’s difficult to get to the kids to school without them ending up drenched. These are just some of the things that Fred and ETB continue to face, but he does work tirelessly each and every day to make sure that these families are given every opportunity to make a life and a living. It’s not easy, there are the heartbreaking times, and this community is no different to any other community anywhere in the world – people fall ill and no amount of help can save them, there are still domestic and social issues to contend with and there are the have and have nots. Fred and ETB know this is not a short term fix, it’s a long term journey, but one that we are already seeing the benefits of. We have no doubt that over the coming years, this community will stand alone and be a model for other communities in the same situation. What’s important to remember is that the people living on the dump aren’t second class citizens, they’re people just like us. Everyone deserves the opportunity to make a life for themselves and this community is doing just that – being empowered – just with the help of Fred and ETB. We take our collective hats off to Fred. Without him, this community wouldn’t be in the position it’s currently in today, but with him, the opportunities are endless. It does come with its challenges, but the rewards speak for themselves. Connect with Eyes to Burma on Facebook!